Directed by famous horror-filmmaker James Wan, “Insidious” is another supernatural horror film ready to take its audience into a terrorising fictional experience. It surely does its job well, as its scary ambience and thrilling story has led to a development of three other films, one sequel and two prequels. This world of paranormal oddities is always an entertaining topic for movies that have the purpose of infusing adrenaline into its viewers, who seek these unusual dark tales of spirits and ghosts. In this genre and around it are endless choices for your next movie night. From dark to darker, here is the list of movies similar to Insidious that are our recommendations. You can watch some of these movies like Insidious on Netflix or Hulu or Amazon Prime. The director of “The Hills Have Eyes” and “Piranha” decided to take the concept of South Korean horror film “Into The Mirror”, twist it up a little here and there and create a new version and adaptation that would become this supernatural horror starring Kiefer Sutherland, Paula Patton, and Amy Smart. It has got a good execution on all the scary special effects used and finds a certain balance between the mystery and the jump scares, giving the gore an extra emphasis. Ben Carson is an ex-police-detective who starts a new job as a security guard, in a destroyed department store where the only things that are intact and clean are the mirrors on the walls. He soon begins having visions and hallucinations through them, before realising that an evil force is using the mirrors to reach and kill the people of his surroundings. Read More: Movies Like Mamma Mia! In 1973, a television film of the same name was made, which inspired a bunch of talented filmmakers in creating a remake that saw its release in 2010. Amongst them, was Matthew Robbins and Guillermo Del Toro as writers, and the less-known Canadian comic-book artist Troy Nixey as director. This fantasy horror film delivers a scary atmosphere where violence is key, and creepy mole-rat-inpired creatures within the stunning setting of a dark and terrifying Gothic mansion. Starring Katie Holmes, Guy Pierce and Bailee Madison, it follows an 8 year old girl who moves into a mysterious mansion with her father and his girlfriend, only to find herself releasing evil creatures of the basement, after these lure her into their space with soft and melodic whispers. Children are often used in horror films, wether as the victims or as the predators. In this case, 9 year old Esther is definitely up to no good when she is adopted by a family of four, after the death of an unborn baby has sadly incapacitated their wish for another child. 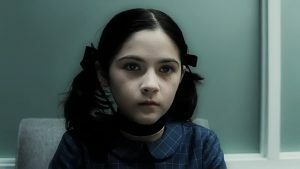 In this psychological horror, do not expect supernatural forces to haunt the characters during the movie (for once), as the true freakiness and fear caused by this story lays solemnly in the mysterious secret of Esther, played by incredible Isabelle Fuhrman. It stars Vera Farmiga as the mother and Peter Sarsgaard as the father, under the direction of Jaume Collet-Serra. The cinematic world of horror films truly is a self-influential circle where ideas come from previous films and where a set of producers and directors often re-appear in most blockbuster films. Funnily enough, it has been said that the concept of “Sinister” rises from a nightmare that one of the film’s writers had, after he had watched “The Ring”. 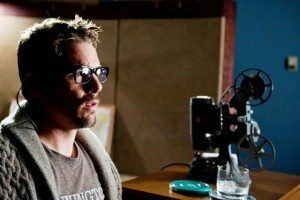 Directed by Scott Derrickson and produced Jason Blum, who also worked on “Insidious”, this supernatural experience brings us into the new house of the Oswalt family, which had previously belonged to a family who was murdered. This mysterious case is the inspiration for the true-crime writer Ellison Oswalt’s next book. 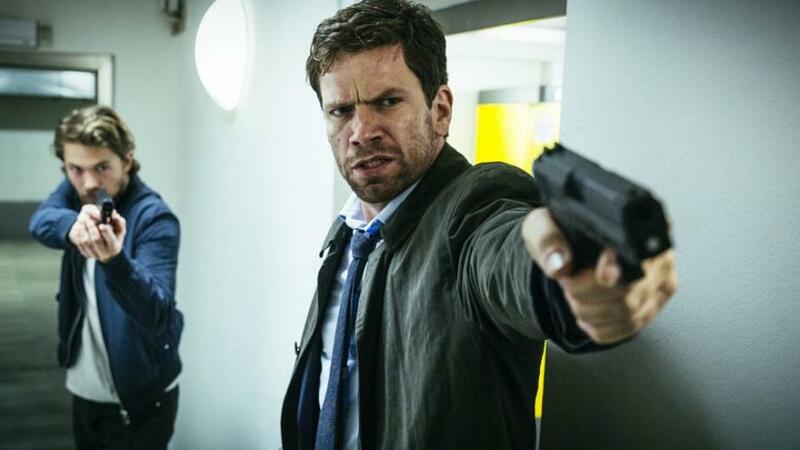 However, he soon discovers a box full of 8mm footage depicting various murders from the past. It won’t take him long to understand his own family is now in danger. Here’s a great supernatural horror that came to light because of the success of a 3-minute short film that Swedish director David F. Sandberg created in 2013. It is a feature-film adaption based on the short version and became the filmmaker’s directorial debut. Simple, yet catchy. It’ll fill your body with adrenaline and sweep you off your seat during its scariest moments. After all, everybody is afraid of the dark and that’s exactly what it’s going to be about. A supernatural spirit attached to girl and boy’s mother won’t let them turn on the lights, because as long as there is darkness, she will live and continue her killing spree. Welcome to the first film that inspires itself from the book of the same name written by Jay Anson in 1977, which is based on “supposedly real” events that happened to the Lutz family in New York. It was a huge success at the time and has had a recent remake in 2005 starring Ryan Reynolds and Melissa George. It recounts the story of a young married couple who buy a new house in Amityville, New York. A year prior to their arrival, there had been a man living there who brutally murdered his entire family. We believe this to be a reason for the strange and scary supernatural events that will soon terrorise the couple up until their escape. A horror classic. Ten years have passed since the beginning of the famous “Paranormal Activity” series. When the film first came out, the world was shook. With only a home video camera and some ingenious effects, a found-footage film had impressed a huge audience and marked the beginning of an unforgettable cinematic experience. It’s great that a film with slow editing, silence and empty rooms can have the same effect as a big-budget production filled with visual effects and fast camera movements. It’s the small things that count, such as the simple storyline we are faced with : after a couple of move into a new house where Katie feels a presence following her around, Micah decides to put up some cameras in order to catch any paranormal activity that could be happening in between their walls. This film is truly a genius concept in the realms of the horror genre. It became one of the most successful independent films ever made and popularised the found-footage style that was later used in various films such as the famous Paranormal Activity series. It is simplistic, yet incredible effective in its purpose of getting under your skin. 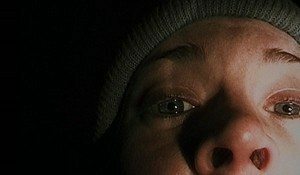 At the beginning of the movie, the filmmakers tell you about three film students who disappeared in the woods of Marylandin 1994 while shooting a documentary about a local legend called the Blair Witch. One year later, the footage was found. Welcome to the movie. 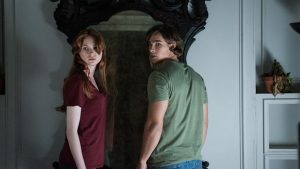 “Oculus” does not lack imagination, as this crazy story of supernatural forces living through a big and imposing mirror will not leave you bored, even just for a second. It’s got its horror formula right on the spot, giving it more of a fear-inducing story rather than a gory visual rampage. It follows two storylines that’ll interconnect in the story’s development, one set in the present and the other 11 years in the past. We’re introduced to two main characters : Kaylie and her brother Tim, who has just been released from a mental hospital because of having been related to his parents’ death. However, his sister is there to prove the real truth behind her family’s past. A truth connected to a mysteriously dangerous mirror, she knows how to get access to. 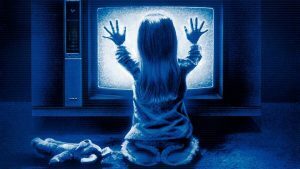 One of the few iconic classics of the horror genre is without a doubt the unforgettable “Poltergeist”, directed by Tobe Hooper, written and produced by Steven Spielberg. It has influenced a number of other movies, especially due to its innovative supernatural elements and for its excellence and impactful storytelling. 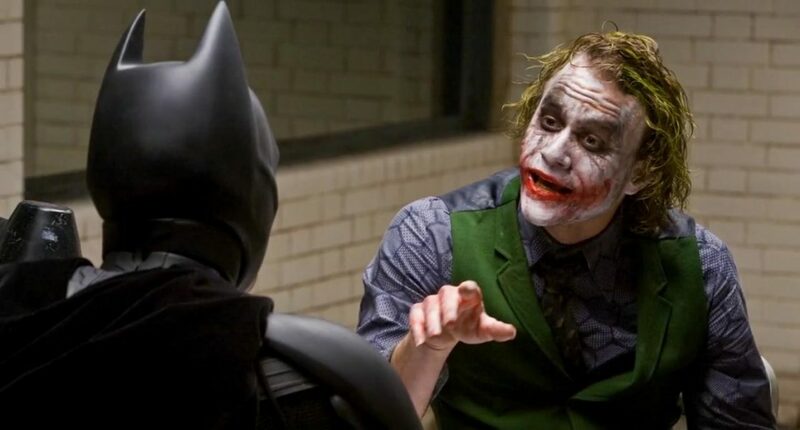 It was nominated for three Academy Awards and developed itself into a franchise, with two sequels and a remake. It follows a family’s encounter with ghosts that haunt their home and abduct their youngest daughter, Carol Anne. Press play and let the terror start once the iconic blonde child stares into the television set and casually informs “They’re here!”. 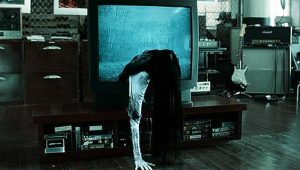 “The Ring” is one of those horror films everybody has on their list, wether they’re a fan of the genre or one trying to experiment other horizons. It is visually well-crafted, with a spooky atmosphere and creepy elements. Although the character development is poor compared to other supernatural horror movies, it’s got an investigative side to the story which makes it more interesting than the common mysteries of the paranormal world. Starring the irresistible Naomi Watts, this remake of the Japanese 1998 film tells the story of a video tape that promises the viewer’s death within the timeframe of 7 days. While trying to uncover the secret behind this phenomenon, a journalist discovers more than what meets the eye and puts her own life at stake for the benefit of the truth. Following the first film’s success, came the first sequel three years later. It follows new events occurring to the Lambert family after the intense experience they went though in the first chapter. They soon discover that their connection to spirits and supernatural existence is not yet to be over, as they must dig deep into the past in order to save their future. If you’ve enjoyed the first instalment in the series, then you probably don’t want to miss this one. Within the same unsettling and disturbing atmosphere, we’ve got the right amount of jump scares once more, that accelerate the heart and dilate the pupil just like a horror movie should. 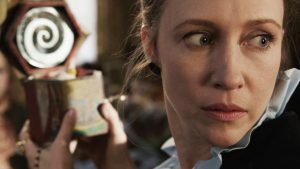 Inspired by the real-life paranormal investigators Ed and Lorraine Warren (the latter who is now 90 years old), the story of “The Conjuring” has become popular worldwide, becoming one of the top grossing horror films ever made. Directed by the same horror-specialist who created “Insidious”, it is an effective piece of thrilling terror that goes back to similar themes and techniques of classics such as “The Exorcist” without forgetting to utilise the skills of modern technology, bringing a beautifully creepy cinematography to the screen. It recounts how in 1971 the Perron family seeks help from demonologists Ed and Lorraine after witnessing and being a victim of numerous paranormal activities and bizarre events in their farmhouse in Rhode Island.